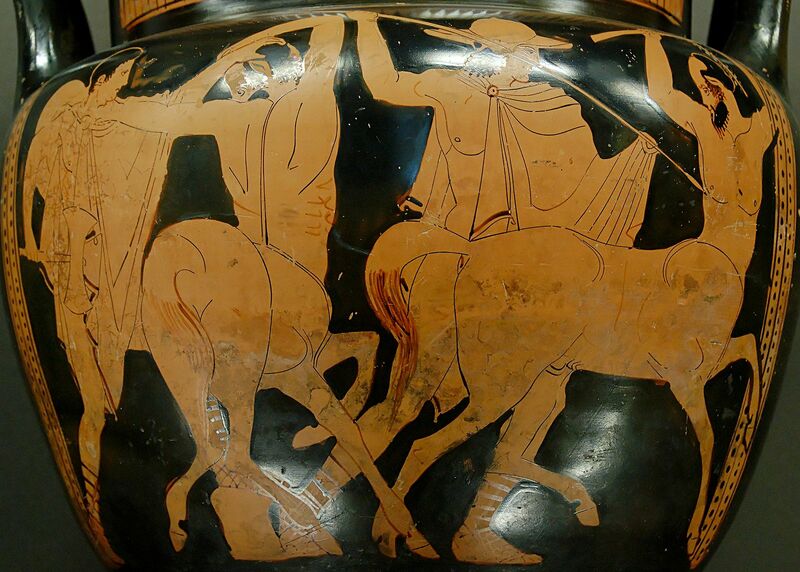 Centaurs (Κένταυροι) are (upper-)half man and (lower-)half horse, familiar from modern works of fiction, like the Harry Potter sage where centaurs rescue Harry and company from the giant arachnids, IIRC. In Greek mythology there are two sorts of centaurs, the type that drinks too much and starts fights at weddings, and the kind that teaches all the promising Greek heroes the arts they will need, including medicine. Centauromachy. Side A from an Attic red-figure column-krater, ca. 450–440 BC. From Fasano, Italy. Louvre Museum Department of Greek, Etruscan and Roman Antiquities, Sully, first floor, room 43, case 12. Accession number G 367; Campana Collection, 1861; Beazley, Attic Red-figured Vase-Painters (1963), 1088, 1. PD Courtesy of Marie-Lan Nguyen. In the Argonautica, Apollonius Rhodius (3rd century BC Greek epic poet and scholar of the Library of Alexandria) refers to the healer Cheiron (Chiron) the Centaur as half horse and half divine, a claim not made for the other twiform chimeras [see: “Chimera Contemporary: The Enduring Art of the Composite Beast”]. In addition, Chiron has only one set of horse legs, his front hands being free to work their healing magic and provide the etymology of his name: Χείρων “hand”. He may be depicted wearing some items of clothing, a rarity among the centaurs, signifying how civilized he is. Sometimes the centaurs are linked together, but sometimes the wise old Cheiron is separated out. Even the genealogy is different, although shape-shifting appears in both. Cheiron’s parents were the Titan Kronos and the Oceanid nymph Philyra of Mt. Pelion, but familiar from other stories of philandering gods, Kronos already had a wife, Rhea. When Rhea was about to come upon the mating scene, the Titan turned himself into a horse, and so it was that the nymph gave birth to a creature that was half horse. The ordinary centaur resulted from the coupling of Ixion and the cloud he thought was the queen of the gods, Hera. Sometimes centaurs are therefore called Ixionides (ΙΞΙΟΝΙΔΗΣ). The cloud shaped like Hera is called Nephele. Nephele (νέφος nephos “cloud”) was but a cloud, however, so to give birth, she rained the Kenaturoi onto Mt. Pelion. Or she gave birth to one humanoid Centauros who gave birth to more horse-humans after mating with the mares on Mt. Pelion. Born on the same mountain, Chiron cared for his foster siblings. Combative centaurs mostly appear on Parthenon metopes (23 of them, according to “Centauromachy and Amazonomachy in Greek Art: The Reasons for Their Popularity”; 92, according to The British Museum), metopes of the Temple of Zeus at Olympia [“The Temple of Zeus at Olympia, Heroes, and Athletes”], and other artwork. Conceivably the Centauromachy symbolizes Greek victory over the Persians, well-known horsemen, with the centaurs representing the Persians, the Lapiths, the Greeks). On the other hand, Chiron appears in many pieces of Classical literature. He is credited at least in some instances with having taught: Asclepius, Aristaeus, Ajax, Aeneas, Actaeon, Caeneus, Theseus, Achilles, Jason, Peleus, Telamon, Perseus, Herakles, Oileus, Phoenix, and Dionysus. While most of the centaurs are boors, Cheiron is not the only one with a favorable reputation. Herakles’ friend Pholus was another wise, civilized one. Unlike Cheiron, he was mortal, however. To distinguish him from the other mortal centaurs, a special genealogy has been applied to him, as the son of the satyr Silenus and an ash-tree nymph. Both Cheiron and Pholus fall victim to one of Herakles’ poisoned arrows. Cheiron must give up his immortality in order to die, while Pholus simply dies. Sources on the Centaurs include [list from Carlos Parada’s article on the Centaurs] Apd.Ep.1.20; Dio.4.69.5, 4.70.1, 4.12.6; Hyg.Fab.33; Ov.Met.9.123, 12.210, 12.504; Pin.Pyth.2.20ff, 2.44ff. ; Vir.Aen.8.293. There are many doublets in Greek mythology. Even within this doublet on the centaurs, we saw an extra one: Cheiron and Pholus. The Enduring Art of the Composite Beast,"
"Centauromachy and Amazonomachy in Greek Art: The Reasons for Their Popularity,"
"The Temple of Zeus at Olympia, Heroes, and Athletes,"